I am a first time blogger and a first time mom of twin girls. I have to say, I never really thought I would be a blogger. However, I love to journal. Unfortunately, sitting down and writing – you know, with that thing called a pen and paper – is just not at the top of my ‘to-do’ list lately. Opening up my laptop and blabbing about life through a keyboard seems much more manageable. Bonus: when I go back to read a late night groggy posting, it will be legible! I plan to post as time allows. I look forward to sharing my life as a mama of two. I am solely using this blog as a tool to escape from reality for a moment… to talk about ‘my reality’. Hmm, makes sense. Hopefully others can relate, laugh, cry and even cheer with me while accomplishing the multitude of tasks needed to be done daily in order to survive and happily thrive as a mama with two little ones. 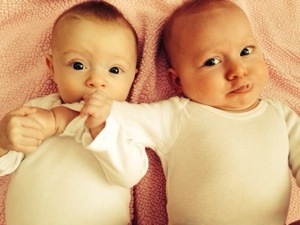 Speaking of little ones… My two littlest loves, Alaina Joy and Hannah Jean are 6 months old (6 weeks adjusted) and are truly my world. Their nicknames inspired the name of the blog – Lainy bug and Hannah bean. They are curious, wiggly little smiley girls and I have to say, it fits them perfectly. So, follow along if you’d like… as I learn how to comfortably fit into this new, expensive, and oversized outfit called MOTHERHOOD :). Enjoy. I love it Shannon! Keep writing, you are good!